St. louis continued their great play in the MLB since the turn of the millennium – with an MLB best 100 wins in 2015. The organization has transitioned to the next core of young nucleus, while still holding on to a couple of capable veterans. Considering they have plenty of depth, and lots of payroll flexibility coming forth, the franchise could orchestrate a blockbuster trade soon. St. Louis could always sign 1 – 2 Starters via Free Agency as well. As it stands right now, the club has a payroll of around $133 MIL listed in 2016. They can afford to add about $15 – $17 more million without batting an eye. 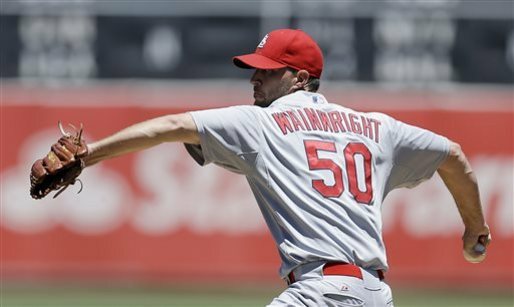 The Cardinals continue to be the model franchise in the Major Leagues. With 9 NLCS births since 2000, this club has thrived with rolling over the roster, and not making mistakes on the Free Agency watch. 2016 shouldn’t be any different for competing for a playoff spot. St. Louis won 100 games in 2015 – and may top the century mark in 2016 again. Crazily enough though it might not be enough for a Division win. I think I can safely say the Cards and the Cubs are the two best all around teams in the big leagues right now. I am still giving the nod to Chicago as the favorite right now, but that may change with some winter alterations. Word has come down that Matt Holliday has been taking reps at 1B this offseasons. If he were able to convert that to his positional arsenal for the next few years, than that would free up Matt Adams to be traded. I Have hammered this point to a fault, and sound like a broken record, but look at the proof. The Cincinnati squad has reeled off 4 wins in a row, 7 out of 10, and have climbed within a game of the playoff bar. With a winning pedigree over the last several years, how are they tied for 16th only in odds to win the World Series with Boston? Give me the Redlegs any day with their 42 – 38. and a healthy team for the 1st time all year, and many ALL – Star toting the uniforms. I nailed the odd when it was +6600, so I am definitely on the bandwagon for a hot team, that is still paying great value. If they make poststeason, you can extensively hedge if need be with starting base that high. So I have finally had a sub-par week for predicting World Series Odds. My worst selection was putting faith in the Royals, only to see them jump from +2500 – +3300, and the Red Sox plunged a +700 mark to +4000 from +3300. It was somewhat diffused by picks for Baltimore to shoot upwards as a favorite, and I am still miffed at the Reds receiving no love at all. Cincy has won 4 in a row and 7 – 10, and are climbing heavily into the Wild Card Race with the Dodgers and Cardinals. With how fast the Giants are coming back to LA in the NL west, it may be these three teams fighting it out for 2 berths, with the loser of the Nats/Braves division, SF, and the Bucs still right in the loop. Right now the oldest professional baseball team is playing some great baseball, have a fully healthy squad for the first time all season, and we are talking about a club who has made the playoffs in 3 of the last 4 years. Billy Hamilton has batting over .300 since the end of April, and now Brandon Phillips and Jay Bruce are coming around, and it is only a matter of time before Joey Votto gets right. Todd Frazier has been one of the best baseball players in the NL this campaign, and is currently tied for 3rd in NL HRs. Devin Mesoraco is almost averaging an RBI per game, and is slugging .627 as a Catcher, with 14 HRs and 40 RBI in 47 Games Played. Aroldis Chapman is lighting the lamp with 100 MPH. Jonathan Broxton is filthy. and the Starters are throwing the ball. The Reds have all shown up for Spring Training, and the team seems to be in jovial spirits for the most part – except for Brandon Phillips attitude towards the media. Maybe Follow @datdudebp is upset about the recent news of the Homer Bailey 6 YRs/$105 MIL extension. Perhaps it grates him that Joey Votto starts his 10 YRs/$225 MIL deal in 2014. Phillips is in the 3rd year of his 6 YRs/$72 MIL contract, he will make $48 MIL between 2014 – 2017, before he hits Free Agency in 2018. 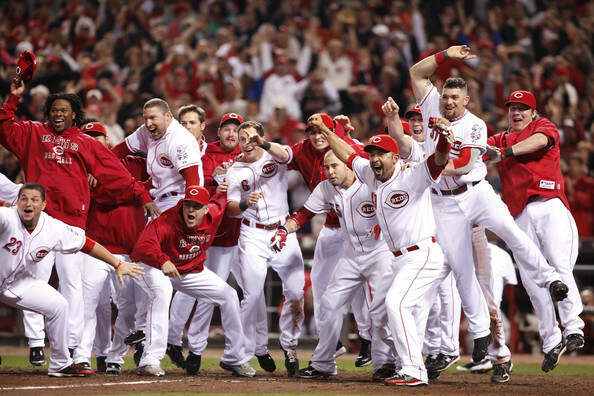 Cincinnati Reds State Of The Union: Is 2014 The Year? 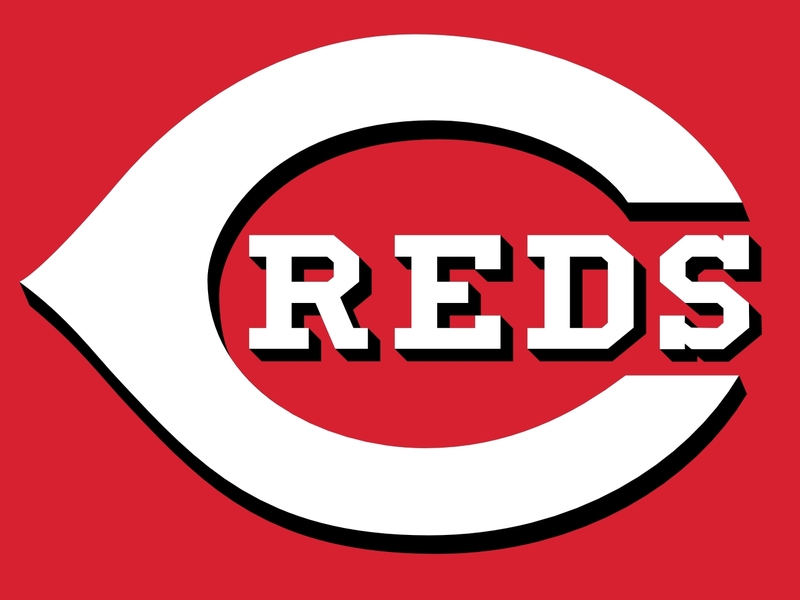 The Cincinnati Reds are coming off of a heartbreaking season, losing in the one game playoff to the Pittsburgh Pirates. They finished third in the National League Central after winning the division in 2012. Manager Dusty Baker had to be fired so a new manager could take this team to the promise land. Cincys will most likely lose Shin-Soo Choo to Free Agency, and put Billy Hamilton in center field next campaign. Is 2014 the year of the Reds? For the Cincinnati Reds 2013 ended in a disappointment. The Reds won 90 games once again, finishing 3rd in the National League Central, but couldn’t get past the Pittsburgh Pirates in the National League Wild Card. Right after the season the Reds manager Dusty Baker was fired. I could write a full post just on Dusty Baker and how many things he did right/wrong but I won’t get into that. 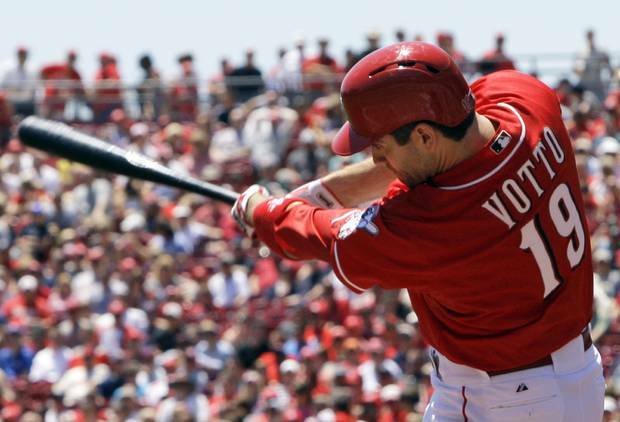 Joey Votto is having another good season for the Reds and he will be force in their lineup for years to come. The power numbers for him are down from years past with him only hitting 16 HRs and having 47 RBIs. However the opposition still has to respect his bat and if a pitcher makes a mistake expect him to hit the ball a long way. He has a .317/.429/.931 triple-slash in 388 at-bats this season with 20 Doubles. He is 7th in the NL with 195 Total Bases, and is also 8th with a WAR of 4.7. Votto is 1st in Times On Base in the NL at 202. He obliterates right-handed pitching with a .335 batting average, and handles left-handers just as good with a .286 average. The Cincinnati Reds are playing well this season with them winning 59 games, but they are five games out of first place. The Reds are 3rd in the National League Central division behind both the Pittsburgh Pirates and St.Louis Cardinals. Cincinnati is third in the NL with them scoring 463 runs on the season. They are great at home, and have the 2nd best home record in the NL. The problem for them is hitting away Great American Ball Park with winning just 27 games and three games under .500 on the road. Greg Holland has picked up in the 2nd half exactly where he left off in the 1st half, with back to back Saves versus the AL Central leading Tigers to start the Post ALL – Star portion of their 2013 campaign. Holland, The 27 Year Old from Marion. NC, is 2 – 1, with a 1.70 ERA and 24 Saves in 35 IP – and a phenomenal 61 Strikeouts. 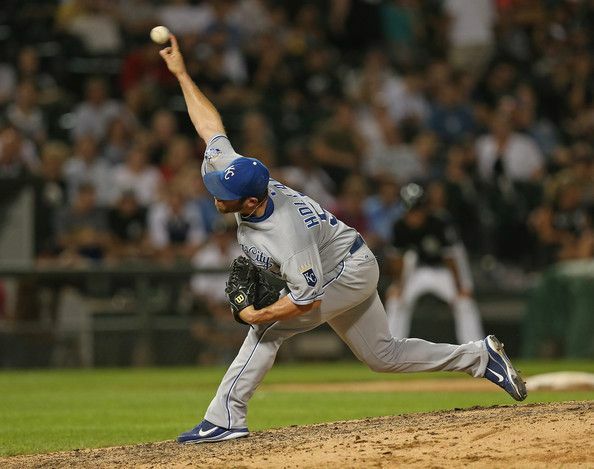 He made his 1st ALL – Star game in New York City last week, and has provided a dominant Closer for the Royals. It seems like a distant memory now, but controversy existed in the backend of the Royals bullpen during the first week of the 2013 season. Greg Holland, the incumbent at the closer position, had a shaky first couple of appearances and some were anxious to have set-up man Kelvin Herrera take over the reins. Herrera, the hard-throwing 23-year old, led the American League in 2012 in average speed per-pitch, according to PitchFX, at 97.4 MPH. Herrera complicated the situation by gathering two early saves, striking out all four outs he recorded in those saves. Sean Marshall Injury: Has It Created A Chink In The Armor? 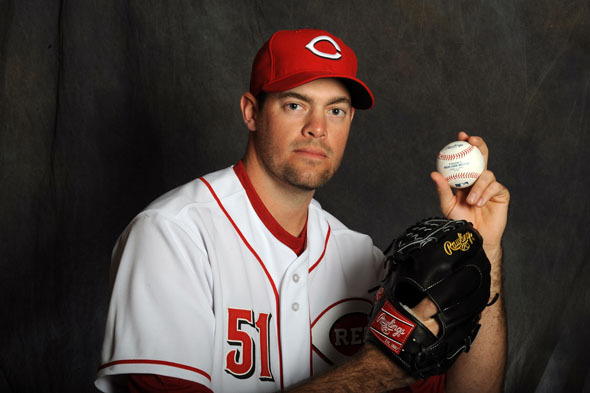 Sean Marshall was acquired by the Reds in Dec of 2011 in a trade with the Chicago Cubs. 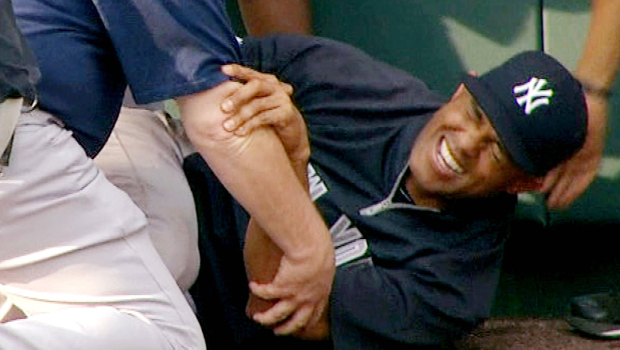 In 74 games and 61 Innings Pitched in 2012 – he Struckout 74 batters and carried a 2.51 ERA. He is a guy good for 75-80 Appearances – and a mid 2.00 ERA. Outstanding numbers for a Relief Pitcher looking to lock down holds for the later Inning guys. The Reds are happy that they have Chapman back in the Bullpen to solidify the Relief Core – plus shorten games, but who will take over in the 7th Inning Role while the LHP is out? Injuries, as we know are part of the game. Every team will have to overcome them, some more than others. In Cincinnati, the Reds are already dealing with their second key injury. Left Fielder, Ryan Ludwick went down on Opening Day after doing his best Pete Rose impression into Third Base, resulting in a torn labrum. He won’t be back anytime soon. Now, Reliever Sean Marshall is on the mend, placed on the 15 Day Disabled List this past Wednesday with shoulder tendonitis. In his 1st half season during last year, Joey Votto clubbed for a 3 Slash Line of .348/.471/1.124 with 35 Doubles, 14 HRs and 48 RBI. He was the leading candidate to pull in his 2nd NL MVP Award. Once he returned from injury, he was not the same – only plating 8 RBI and HRs in the last 28 games he played in. The Canadian still led the NL in OBP for the 3rd straight season. He also led the NL In Walks despite missing 51 games. Votto has a Career 3 Slash Line of .316/.415/.968. He is signed through the 2024 year in a 13 YR/.$263 MIL deal. MLB Reports: Welcome to our newest Kids writer Jason Alpert-Wisnia – for being selected to join our MLB Reports Kids Writing team. We are pleased to present the readers with a youthful look to the game of baseball. Moms and Dad’s – if you have a young kid who loves baseball and wants to write about the game, please email us at mlbreports@gmail.com. We will be selecting three more kid writers for our website this year. The Cincinnati Reds last season had a 97 Wins and 65 Losses Team Record, scoring them 1st place in the NL Central last season. The team could have made it even farther in the Postseason, maybe even beating the Giants and becoming the NL representatives, BUT, they missed their chance in losing 3 straight tries to eliminate the club from the BAY after taking a commanding 2 – 0 lead in the Series. During the year Joey Votto injured his knee and was out for a while along with the manager Dusty Baker having a stroke, and you have to wonder about these two incidents not factoring in them feeling less than 100% heading into the Playoffs. You throw in Johnny Cueto‘s injury moving up all of the depth on the Starting Pitching versus the Giants in the 2012, and you can see that things spiraled downward. 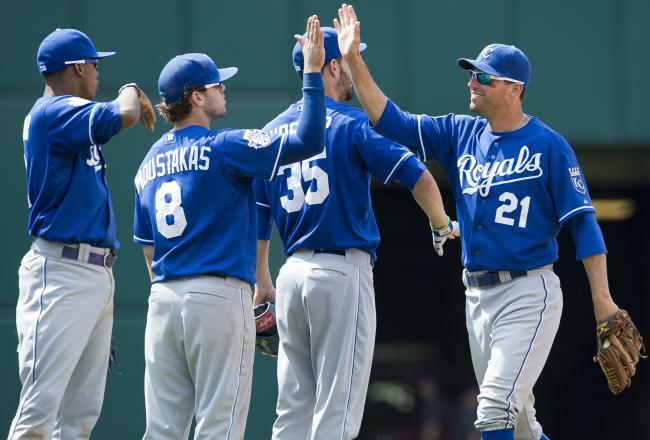 There should be a lot more smiles and high-fives for the Royals in 2013 as they are continue to improve around their core of talented players. Will 2013 finally be the year the Royals make their long overdue return to the playoffs. They are amongst three teams who have not made the playoffs since the 1994 Lockout (TOR (1993) and PIT – (1992)) and they hold the longest streak of not making an entrance into the Post Season. KC last made the playoffs in 1985 – when they won their 1st and only World Series. With the Royals finishing the 2012 season with a 72-90 record, the eighth year out of the past nine in which the team finished with at least 90 losses, General Manager Dayton Moore spent the winter focusing on acquiring durable pitching to strengthen the rotation in the short-term, including a controversial trade with the Tampa Bay Rays that reads like a law firm transaction: Myers, Montgomery, Leonard, & Odorizzi for Shields, Davis, & Johnson. 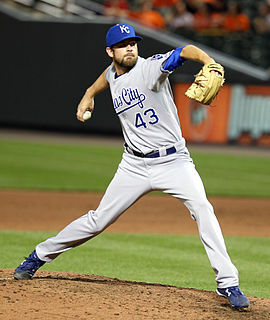 Although the merits of the deal can be debated, as it cost the Royals one of baseball’s top prospects in Wil Myers, the Royals hope that a rotation now featuring three veterans arms, a young, powerful, and strong Bullpen, and the hopeful continued growth of the team’s young hitters can lead the organization to its first playoff appearance since its World Series Championship in 1985. As Spring Training has progressed into Cactus League action, the Royals opening day roster appears to be predominantly solidified with the exception of one relief spot, backup Catcher and Second Base. Aroldis Chapman – Starter Or Closer: Perhaps 2013 Will Solve The Answer? 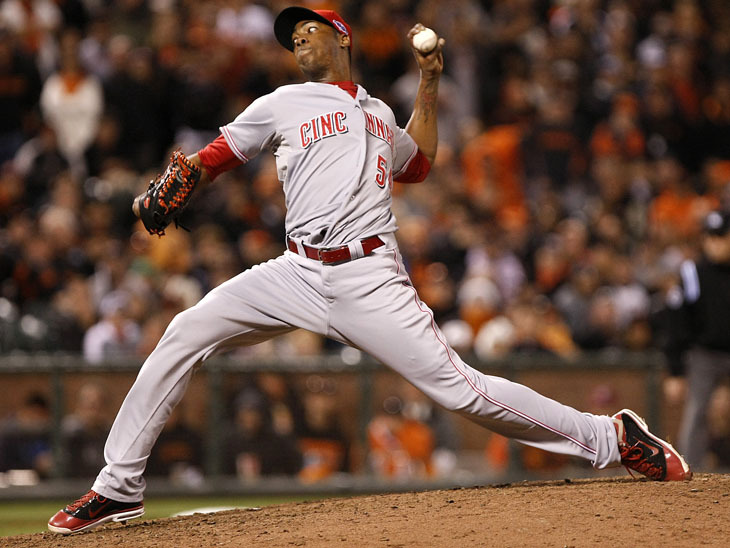 Chapman was filthy dominant in the 2012 season, with a 1.51 ERA, WHIP of 0.809 and 38 Saves as the teams closer. He made the ALL-Star Team, finished 8th in NL Cy Young Voting and 12th in NL MVP Voting. Will moving him to starter be a mistake? The biggest question from Reds fans this offseason has been if the move from the bullpen to the rotation is the best move for Reds pitcher, Aroldis Chapman and the team. Why fix what isn’t broken? Does he have enough pitches? Can he pitch enough innings?….the answer to these and all of the questions you can think of is pretty simple; we’ll find out. This plan wasn’t something the Reds came up with overnight, when he was signed to a 6 year $30 Million deal in 2010 it wasn’t to close ballgames. It was to eventually be a member of the rotation. In 2010, the rotation consisted of Aaron Harang, Edinson Volquez, Bronson Arroyo, Johnny Cueto, and Homer Bailey. Out are Harang and Volquez, in are Mat Latos and Mike Leake, who looks to be the odd man out in 2013 for Chapman. In his final season for his Cuban team, Chapman pitched 118 Innings as a Starting Pitcher, which won’t nearly be enough for the Major Leagues. The only taste of Chapman as starter against at least some semblance of Major League hitters came last year in Spring Training before closer Ryan Madson suffered a season-ending elbow injury. Chapman went 2-0 with a 2.12 ERA, striking out 17 in 18 Innings, walking only 2. There should be a lot more smiles and high-fives for the Royals in 2013 as they are continue to improve around their core of talented players. 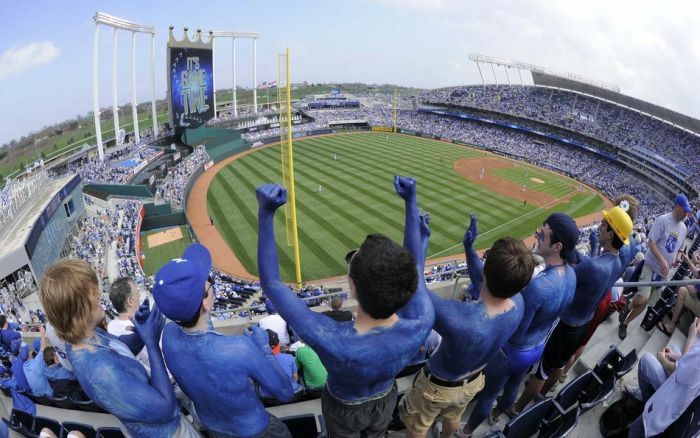 Will 2013 finally be the year the Royals make their long overdue return to the playoffs? The Kansas City Royals have been notorious bottom dwellers of the American League Central for years now. Their last and only World Series title came in 1985, and since then they haven’t even made a playoff appearance. After the ’93 season – the Royals moved from the AL West to the AL Central, and have only finished with 80 or more wins once. The 2013 Royals shouldn’t let this dismal past hold them back though. The 2013 Royals should be better than the 2012 team which finished a somewhat respectable 3rd in their division, and the team of 2013 has the potential to be the best team the Royals have had in the past 20 years. There are a lot of variables that could make or break this Royals season, so you might not want to mark them down for a World Series appearance just yet, but making the playoffs with a winnable Central Division, and two wild card spots up for grabs might be within Kansas City’s reach. The core is as solid as ever and they could potentially attack next year with more speed with some recent trades and Draft Picks. 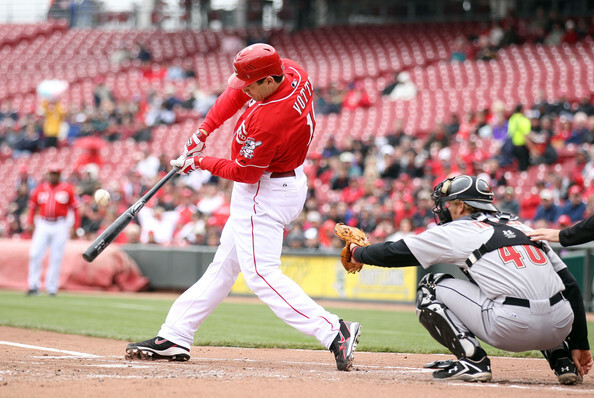 The Reds will be a fast, entertaining team with lots of power from both hitting and defense. 97 wins. NL Central Championship. Knocked out of the playoffs by the eventual World Series Champion, San Francisco Giants in the NLDS. That’s the story of the 2012 Cincinnati Reds. Everything that was going so great in the summer of 2012 ended abruptly, leaving many people scratching their heads wondering what went wrong? How did this team, who went 2-0 in San Francisco in the NLDS, come home and lose 3 straight at Great American Ballpark? Having nobody on base when Joey Votto came to the plate didn’t help, but that was only part of the story. Lack of clutch hitting was another problem. You could point fingers at skipper Dusty Baker as well, who did not manage with the sense of urgency that San Francisco’s skipper Bruce Bochy did. Either way, it was a team effort to get where they got, and a team effort on why they didn’t get to where they wanted to be. Broxton, Marshall and Chapman: Modern Day Nasty Boys? The resigning of Jonathan Broxton is an interesting one for the Reds. The feeling is that this paves the way for Aroldis Chapman to head to the rotation. It could also just be securing the back end of a dominant bullpen from this past season that many have compared to the 1990 Nasty Boys. The Reds haven’t said for sure, which isn’t surprising considering how close-to-the-vest they operate. Like last season, Chapman will likely go into Spring Training as a starter, and the team will go from there. 2012 was a season that ended with disappointment which ultimately distracted us from recognizing what a successful year it really was. 2012 highlighted a lot of the greatness that is to come for this great franchise. The St. Louis Cardinals came into 2012 as the defending World Series Champions. 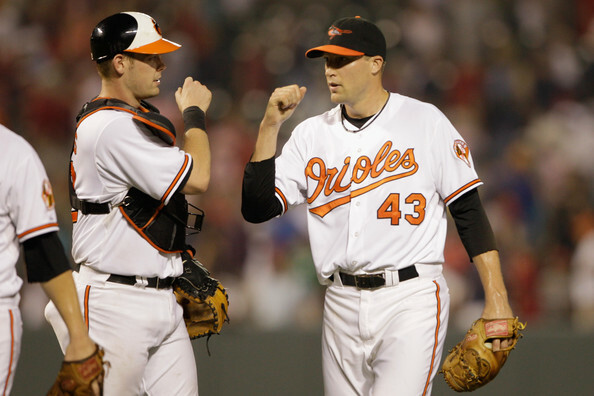 In 2011 they just eked their way into the post season on the final day of the regular season when they defeated the Houston Astros and the Braves, who were tied for the wild card spot with St. Louis, ended up losing to the Phillies in extra innings. Coming into the 2011 postseason, the Cardinals were huge underdogs. That didn’t stop them from going for what they wanted: to win it all. 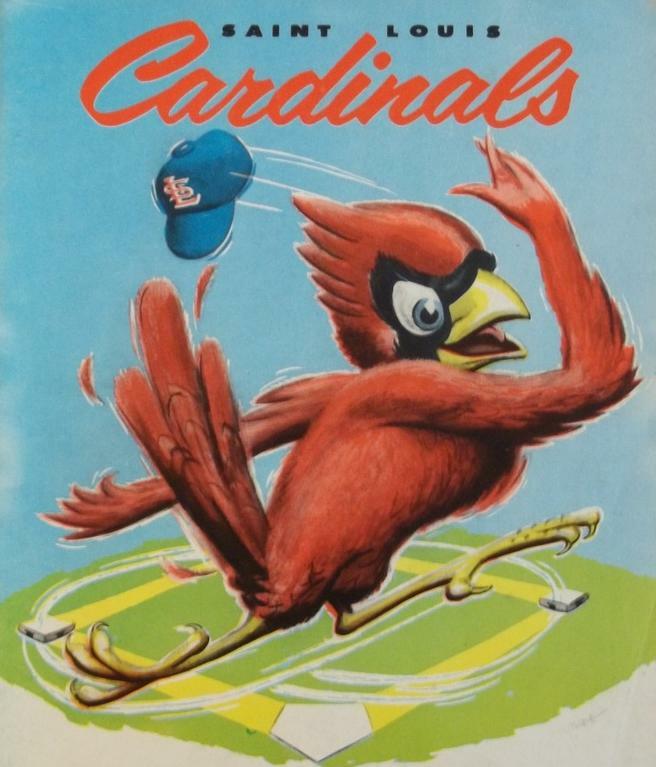 While most analysts amongst the sport would not have guessed St. Louis would even make it to the World Series, yet alone win it, the Red Birds emerged to show their true colors. The current team that the city of St. Louis has assembled and gets to watch for 81 games a year is, undoubtedly, a team that plays on all cylinders and the highest octane fuel. They play with the intensity of a little league team that wants nothing more than the coach to bring them out for ice cream when they win. Watching the Cardinals brand of baseball is to watch baseball again as a game, and not just as a competition played by millionaire athletes with tremendous talent. 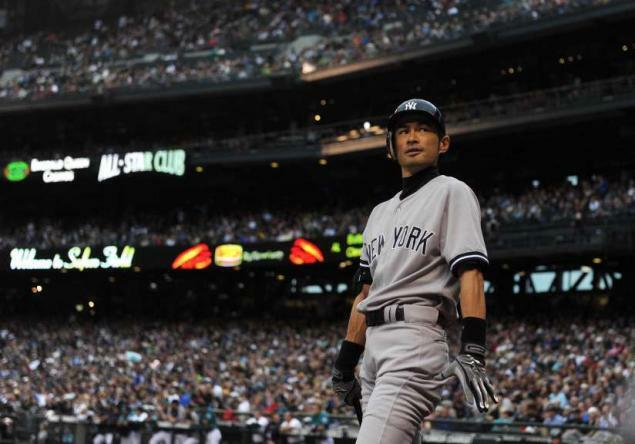 Ichiro Suzuki played the best baseball he has in the last 2 years with the Yankees. It would be a wise move to re-sign the guy for at least the next season. 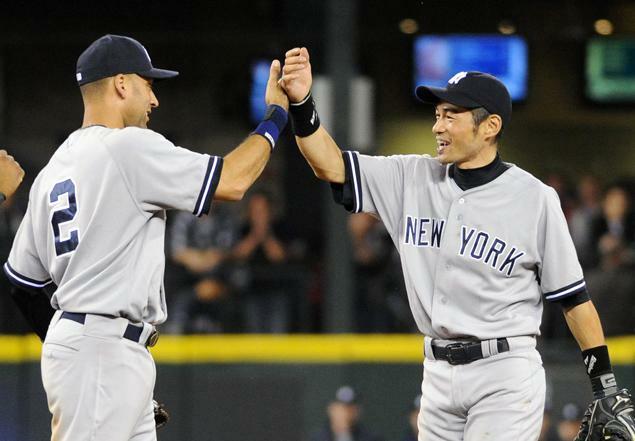 In my opinion, they should have Jeter and Suzuki linked together on the club until they retire. I love the new era of baseball. One thing the 2nd Wild Card team enabled this year was a flurry of transactions right near the Non-Waiver Trade Deadline, plus we even saw a bunch of trades between Aug.01-31 as well. I am not going to breakdown the trades for who went the other way (unless both teams were in contention) since we have a dedicated page for that here. What I am going to do is see who made out well with their new player. I will tell you right now that the hands down winner was the San Francisco Giants for picking up Marco Scutaro and Hunter Pence. Marco Scutaro hit .362 for the Giants and smacked 90 hits in 61 games. He has parlayed another 19 hits in 59 AB during the playoffs (.322). 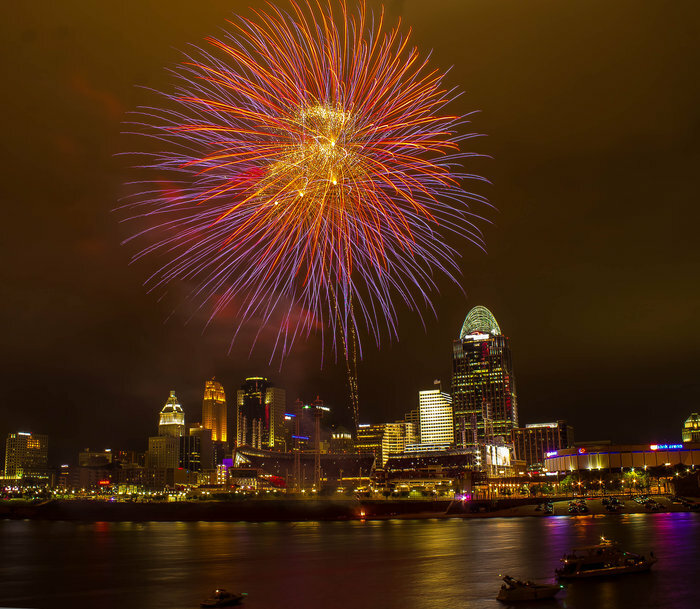 Jake Dal Porto: The Reds look primed to win the World Series. This year. They have all the making of one of those rare seasons. 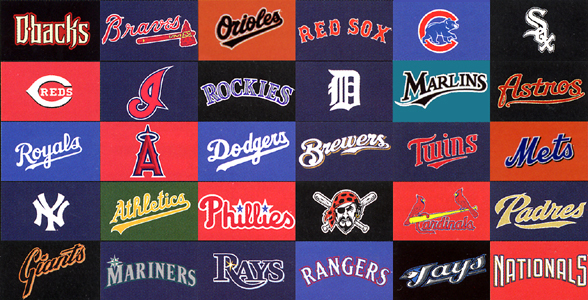 Young guys have stepped up greatly, veterans are producing, and they sit on an 11 game lead in the N.L Central. 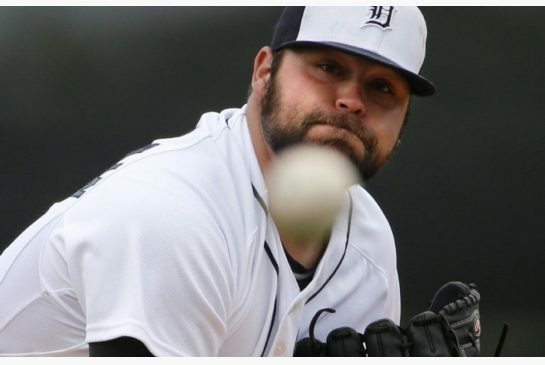 Ryan Ritchey: As I mentioned in my article a couple of weeks ago, Joakim Soria has gone down with Tommy John Surgery and will be out for the rest of the 2012 season. Now the Royals are playing closer by committee until they find a solid candidate to fill the position for the rest of the year. In my opinion the Royals are not going to contend in the AL Central, so they can give some of their young talent a chance to close.